Lately I've been enjoying the UK sitcoms Siblings and Plebs, both of which I love. What comedy shows have you been watching lately? 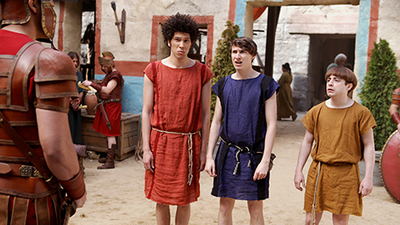 Plebs promotional image from ABC1. Fair use. Absolutely none as there are no good ones on at the moment. Plenty of repeats which I have seen so many times, and much as I love Seinfeld and Fawlty Towers, I cannot watch them again. There are a few US ones but I generally prefer UK comedy so am not watching any at the moment. Do you watch iView? There are a few British shows on there. We've watched the couple of new Big Bang episodes that have been on but apart from that there is nothing that appeals. Plenty of repeats but we're tired of seeing them over and over. The last sitcoms I watched were Dinnerladies and The Vicar of Dibley a few days ago. Still watching the old ones such as Keeping Up Appearances, One Foot In The Grave, Growing Pains. The newer ones are just not my taste. I just dont think the writing is as good. Bang Theory, Plebs, and Fawlty Towers. I like most of the repeats of British Comedy shows, most seem to have a timeless ability to retain their humour many years later. Comedy, especially USA type, is definitely not for me! The BBC used to have good comedy shows back in the day, but no more, sadly. Pleb, Big Bang Theory, it seems the rest of the best are repeat repeats sadly. NONE! I find them all stupid, but I used to watch the U.K ones only, about 30 years ago!